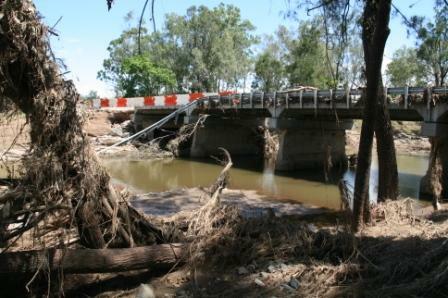 Damage from Australia’s historic 2011 floods. Photo by Tania Duratovic. 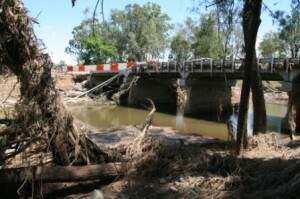 The start of 2011 saw the Australian state of Queensland experience some of the worst flooding in history, resulting in three-quarters of the state, an area the size of France and Germany combined, being declared a disaster zone. Stretching from remote farming communities to the state’s capital, Brisbane, the floods killed 35 people and affected the lives of more than 200,000. The hidden toll, as in many disasters, however, was the thousands of injured, orphaned and deceased animals. 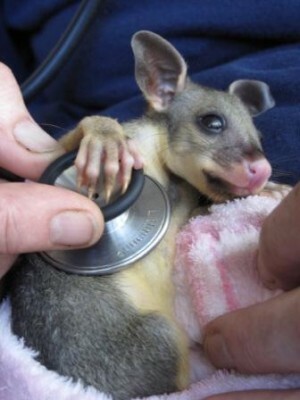 An orphaned possum joey being examined, 2011. Photo by Tania Duratovic. I was asked by an international animal welfare organization to head to Queensland to lead a veterinary and rescue team to help surviving wildlife, companion animals and farm animals. Although Brisbane was badly affected, I had decided to head to the country where I knew that help would be thinly spread and, in relation to wildlife, virtually non-existent. Finding willing and competent veterinarians to treat wildlife, particularly in the country, is very difficult. Over the next week, we worked on the ground with local animal carers treating a variety of species ranging from birds of prey to koalas to horses to various reptiles. While driving around, the damage from the water was clearly evident: brown grass and debris clinging to fence lines, flooded paddocks with ruined crops, washed away roads, scoured-out creeks, destroyed bits of furniture and household goods piled up on roadsides. In some parts the road was too muddy and steep to pass, even in our well-equipped 4WD. Our work in Queensland focused largely on wildlife, a specialist area and one in which hardly anyone does anything during disasters. As a Buddhist, rescuing creatures in a disaster is a real challenge. There are so many creatures you know have died, so many you see that are injured, and many you know will die. But how do you help them? Quietly and secretly, is how I do it. Here, I am referring to giving them Dharma, not medical treatment, although doing that quietly is also advised! Take, for example, Tara (yes, I named her! ), a koala we rescued. 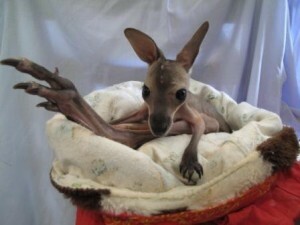 She was found sitting on the roadside making no attempt to get away, a good indication that something was badly wrong. She was old, had a fracture to one of her wrists and was suffering from malnutrition. She also could not see well and was probably blind. Our immediate concern was to give her some pain relief and to get some fluids and food into her. I was also desperately trying to figure out a way to keep her alive beyond our time with her. In Australia, when a wild animal is discovered to be blind, it often means a death sentence imposed by the authorities. Because Tara was one of these animals, if she had stumbled into the hands of one of the local vets, I am sure she would have been killed. Generally, when I work in disasters I work with others who are usually non-Buddhists. As I do this in a professional capacity, I have to behave “professionally.” Having me loudly reciting mantras and prayers at animals and bopping them on the head with holy objects does not look good when a major aim is to keep things calm and quiet. And the topic of euthanasia is always high on the agenda: many animals brought into care are simply killed, and not always because they have no chance of survival, but because it’s cheap, easy and the problem is quickly over. Luckily, we found Tara a home and arranged to build her an aviary hidden up in the hills [of the property] of a wildlife rehabilitator so she would not be visible to people. All week I would steal some time alone with Tara and say mantras to her and bop her with a little consecrated Buddha statue I carry. I sprayed blessed water onto her eucalyptus leaves, of which koalas eat a lot. I would do the same with all the animals that we came across. I have found that this is the simplest and most meaningful thing you can do for animals during a disaster. Sadly, Tara died not too long after we left (by then I was up in far north Queensland dealing with the result of cyclone Yasi and more animal victims). But I am happy she came my way as I was able to give her some Dharma, such a precious gift. Tara was actually one of the fortunate ones. Had she had her life cut short with a needle at some veterinary clinic or died quietly at a wildlife shelter, she would probably again be reborn to suffering in the lower realms. Thanks to the kindness of Lama Zopa Rinpoche and all his advice on how to benefit animals, she now will definitely reach enlightenment. Over and over again we hear about the tragedy of people losing their pets in a disaster. If a disaster is approaching, please remember the animals. There are things you can do to help them even if you have no veterinary skills and particularly if you keep animals yourself. Make sure you have a disaster plan which includes your animals. Getting a rescue alert sticker. This sticker, when placed somewhere visible like your front window lets rescue workers know what species and number of animals you have. Arranging a safe haven for your pets in the event of evacuation prior to it occurring. Call your local veterinarian, shelters, friends, family, etc. Keep a clearly labeled pet emergency supply kit handy. It should include a blanket (to wrap a fearful pet); an extra leash or harness; about a week’s supply of pet food and water; disposable litter trays and litter; recent photos (in case you are separated and need to make “lost” posters); photocopies of medical records and a waterproof container with a two-week supply of any medicine your pet requires; blessed water; a copy of the mantras beneficial to animals; and Recitations for Animals, a CD by Lama Zopa Rinpoche. Store your emergency kit close to an exit in your home along with a labled pet carrier. Ensure your pet is wearing proper identification. Your pet’s ID tag should contain his name, telephone number, and any urgent medical needs. Better still, get your pet microchipped in addition to tags (which can come off easily during a crisis). Keep up-to-date vaccinations and veterinary records (many shelters will not accept unvaccinated animals). Always bring pets indoors at the first sign or warning of a storm, disaster, or fear-producing event (this includes fireworks celebrations). Pets can become disoriented and wander away from home during a crisis. The floods in Australia were a terrible tragedy. While the media focused on the few human deaths and huge economic cost, very little was said about the huge loss to animals, particularly wildlife. With climate change well and truly upon us, the number of animal victims will only increase proportionally with the occurrence of disasters such as floods. While not all of us can rush out and physically rescue animals, we can at least say prayers and follow the advice for disasters given by Lama Zopa Rinpoche. And in relation to our own animals, be prepared. Most importantly, however, is to make sure your animals receive lots of Dharma imprints before there is any obvious risk to their lives. For more information, please visit Enlightenment for the Dear Animals.